At A.B. Richards, we rent ground level portable storage containers for just about any purpose. We’ll deliver your container to wherever you need it. What you do with it, is up to you. A.B. Richards prides itself on helping customers solve their storage problems, and we do it throughout the northeast. We can provide you with 20ft storage containers which can fit on smaller lots. They’re perfect for residential purposes or for small businesses. For larger businesses, you might need our 40ft storage containers or our 40ft jumbo containers which have an extra foot of headroom. They can help keep your inventory close, store items if you own a seasonal business or store construction equipment as we gear up for construction season. It’s a good idea to make sure your equipment is in the best of shape when it goes into storage. The government action website Municbid suggests that you make sure that all equipment is cleaned regularly before being stored. One reason for this is that equipment is very often exposed to dust or dirt when it’s being used on a job site. This can contaminate whatever else you’re keeping inside the portable storage container. Cleaning is also necessary to keep equipment durable and work properly. It’s advisable to keep the equipment lubricated during storage as well. This will help in starting up your equipment when taking it outside. Check the parts regularly to make certain everything is in working order. You should also protect any sensitive parts. For example, wires and electronic components can often become easily damaged, so they should be covered, and insulated from possible exposure to moisture. Another thing to be concerned about when you’re storing machinery and materials on a construction site is security. If you can build fencing around the site and illuminate your portable storage container, this will add even another level of security. 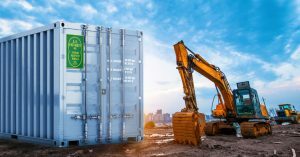 If you’re looking for a portable storage container to keep on a construction site, A.B. Richards containers are sturdy and secure. All of our containers are made of strong, 14-gauge steel, and they also have a strong 1-3/8-inch hardwood floor. Our 20ft storage containers can support a maximum gross weight of 44,800 pounds, while both our regular and Jumbo 40ft containers can hold a maximum total weight of 67,200 pounds. You’ll also be able to padlock our swing-out doors. If you’re ready to rent for construction season, contact A.B. Richards today.